Ramallah (Palestinian Territories) (AFP) - Palestinian football boss Jibril Rajoub called Sunday on Barcelona star Lionel Messi not to play in an Argentina-Israel game in Jerusalem and urged fans to burn their shirts if he does. 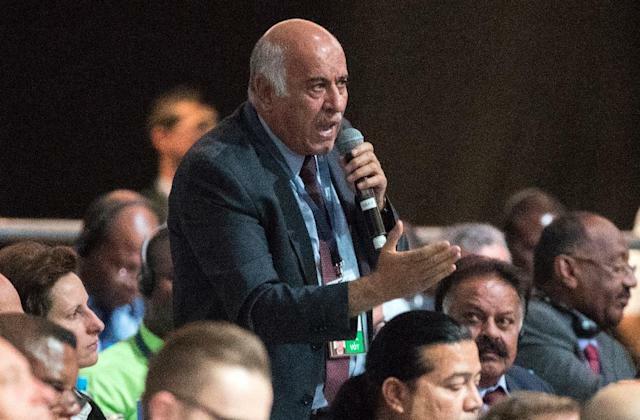 Rajoub, head of the Palestinian Football Association, has long demanded sanctions against Israel, which has six league teams based in Israeli settlements in the occupied West Bank. At a news conference in the West Bank city of Ramallah he told journalists he had written to Argentina's government asking that Messi not take part in the June 9 friendly. "This match has become a political tool," Rajoub said in Arabic. Palestinians claim the eastern part of Jerusalem, annexed by Israel, as the capital of their future state. The Jewish state considers the entire city its own "indivisible" capital. "Messi is a symbol of peace and love," Rajoub said. "We ask him not to participate in laundering the crimes of the occupation." Messi, he added, "has tens of millions of fans in the Arab and Muslim countries... we ask everyone to burn their shirts which bear his name and posters (with his image)." Contacted by AFP, Israel's sports ministry had no immediate response and the Israel Football Association spokesperson could not be reached. The Palestinian association says Israel is in breach of FIFA statutes which state that a member country's teams cannot play matches on the territory of another association without permission. The Israel-Argentina game is to take place at the Teddy Stadium in Jerusalem which has a capacity of 31,733 seats. Tickets sold out within 20 minutes of going on sale last month. Argentina will play against Haiti on May 29 and then Israel just one week before their first match in the World Cup against Iceland on June 16 in Moscow. In Group D, Messi's men will face Croatia on June 21 and Nigeria on June 26. Israel finished fourth in Group 7 in qualifying for the World Cup, behind Spain, Italy and Albania. They last qualified in 1970. In the past, Argentina have played Israel several times in friendly matches, usually before the World Cup, suffering a 1-2 defeat in 1998 but crushing the Israelis 7-2 in 1990 with Maradona at the helm.